Hi ladies. I am back today with another fun layout I created using the September Sundance kit. The patterns and die cuts in this month’s kit is so pretty. I love them. I’ve had these photos for a few months now, but didn’t have the right papers and embellishments to go with them. I pulled the blue and cream colors from the photos to create a well balanced layout. I wasn’t sure at first if the washi would go with this layout, but I managed making it work by adding the tiny red plaid star sticker to help pull the red into the layout. I used a pen and ruler to create faux stitching on the heart sticker. I layered several die cuts together at the bottom of the photo to help pull the photos together. And to balance it out, I added a few more at the top right photo in the corner. Then I added my hand-journaling to complete the layout. Categories: Yearbook | Tags: 1 canoe 2, clique kits, Multi-Photos, Nicole Martel, scrapbooking | Permalink. Hello all. Do you every have a difficult time picking out just one photo for your project? Just recently, I had my sister Katie take a few photos of me and I couldn’t decide on one photo to use so I used my favorite three. haha I created a collage of three photos using PicMonkey and then I printed them out to use on my layout. I love the vibrant colors in this month’s kit and the exclusive stickers and die cuts. Rather than journal on this layout, I used the word stickers to help tell my story. LOVE these stickers. I hand-cut some of the squares along with the butterfly and hearts to use as die cuts for my layout. I totally forgot to buy the die-cuts from the add-ons this month! 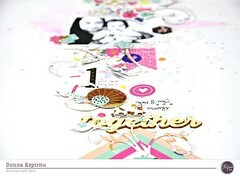 Categories: Yearbook | Tags: clique kits, Die Cuts, Multi-Photos, Nuvo Drops, pink paislee, scrapbooking, Tonic Studios | Permalink.